Windows 10 Insider Preview Build 14926 for PC and Mobile is now available for Windows Insiders in the Fast ring and Slow ring. 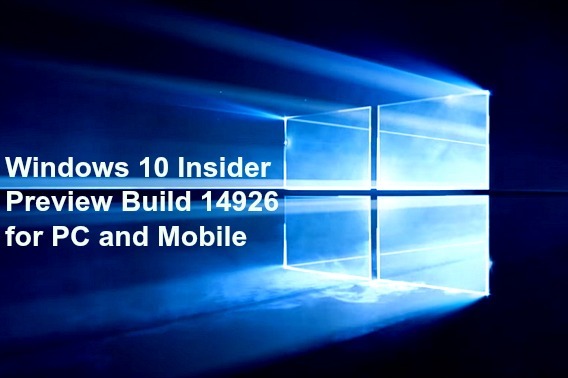 This latest Build 14926 focused on bug fixes and general improvements to addressed issues that feedback received from Windows Insiders experience. To download ISO Images & official ESD Files, just click here. In addition, Build 14926 also has an updated expiration date of May 1st, 2017. If PC running previous build, it will notify build expiration date once a day until 1st of October. Then, PC will start rebooting every 3 hours. Note: If Windows 10 PC running with the Build 14393 Anniversary Update in the Slow and Release Preview rings, the build expire feature will not apply and notify to PC. To update PC to latest Build 14926, just head to PC Settings > Update & security > Windows Update. Snooze in Microsoft Edge which provides users with a way to set a Cortana reminder on the website they are viewing. This feature lets users put a site into a Cortana reminder that will show up as a notification and in Action Center for quickly re-open site in Microsoft Edge. Improving PC upgrade experience. In Build 14926, even after updated to a newer build, Windows will not get reinstalled any of the pre-install apps such as the Mail app or Maps app that users uninstalled. Making pin login easier. In Build 14926, regardless of PC Num Lock state, numbers will be input if users typing into the pin password field. [ADDED] New Extensions in Microsoft Edge – Two new releases extension: 1. TamperMonkey is a popular user script manager that lets users customize the content of pages across the web. 2. Microsoft Personal Shopping Assistant is smart shopping cart across the web, which collects browsed products and provide price alerts for saved products and compare products between sellers. [ADDED] Export favourites from Microsoft Edge – Microsoft added the ability to lets users export their favourites from Microsoft Edge to an HTML file. Just click the “More” icon at the top right (the three dots), choose “Settings”, then “View favorites settings” and user will see the new option. ADDED: We are also investigating reports that after upgrading to Build 14926, some phones lose the ability to use their SIM card. A hard reset also fixes this issue as well. See this forum post for more information. Besides that, Microsoft also announced the new rewards program – Microsoft Rewards, which everyone can earn points for searching with Bing and use Microsoft Edge browsing the web. Once correct the reward point, user can redeem their points for Xbox, Windows gift cards, Microsoft Store discounts, Skype Credits, Xbox Live Gold memberships, and more, or even donate correct point to charity. To join, click here! For Windows Insider, you can continue to earn points even on Insider Preview builds.